...the fascinating story of the notorious drug kingpin's life, death and legacy of suffering as seen through the eyes of his only son, while illuminating Colombia's violent recent history from a new perspective. To some, Pablo Escobar was a ruthless criminal. To others, he was a generous member of the community. To Sebastian Marroquin, he was one thing above all others – a father. 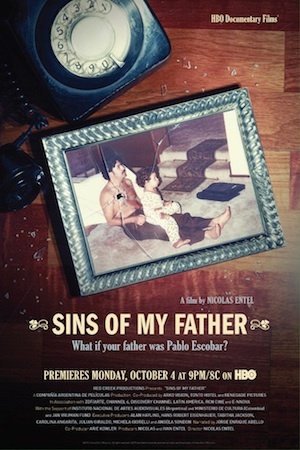 Debuting MONDAY, OCT. 4 (9:00-10:30 p.m. ET/PT), exclusively on HBO, the revealing documentary Sins Of My Father tells the fascinating story of the notorious drug kingpin's life, death and legacy of suffering as seen through the eyes of his only son, while illuminating Colombia's violent recent history from a new perspective. 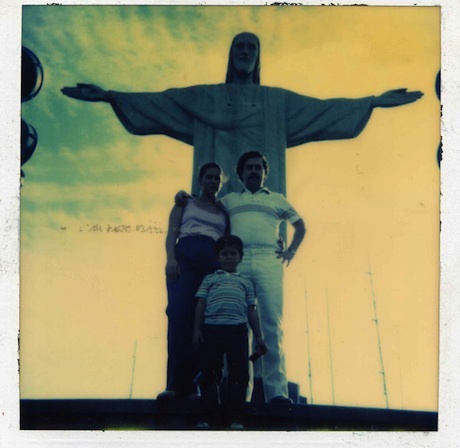 Directed and produced by Argentina- and New York-based filmmaker Nicolas Entel, Sins Of My Father features interviews with Sebastian Marroquin (formerly Juan Pablo Escobar) and his mother, Maria Victoria, and never-before-revealed home movies, photographs and audio recordings from the Escobar family archive. Marroquin, who changed his name and fled Colombia after his father was gunned down in 1993, grapples with the impossible task of reconciling the conflicting roles of his father: the doting family man he still loves, and the stone-hearted criminal who publicly threatened his enemies and their own families. In agreeing to appear in the film, Marroquin and his mother break more than a decade of silence after living in virtual exile in Argentina, where Marroquin now works as an architect. The result is both a startlingly intimate portrait of their years in the Escobar family and a front-row view of Marroquin's reconciliation efforts toward the men his father orphaned 20 years ago. The film also explores the recent history of Colombia, in particular its struggles to ward off the tag of "narco-state" while battling paramilitary groups bent on controlling the country through kidnapping, bombings and political assassination. While Pablo Escobar did not originate these guerilla tactics, he employed them in running the Medellin Cartel in the 1980s. Marroquin recounts how some called his father the "Robin Hood of Colombia," who built soccer fields and a housing community for 5,000 people, and was even elected to the Colombian congress. Eventually, he was tracked down by Colombian and U.S. intelligence agencies and shot to death on a rooftop in Medellin on Dec. 2, 1993. Not content simply to recount history, Marroquin reaches across generations to ask for forgiveness. Sins Of My Father chronicles his reconciliation efforts toward the sons of his father's most prominent murder victims, Colombian politicians and anti-drug crusaders Luis Carlos Galan and Rodrigo Lara Bonilla. His aim is to close wounds that extend across the history of the home they once shared in Colombia and cease the culture of revenge that has permeated the country for decades. The film was an official selection in the World Documentary Competition at the 2010 Sundance Film Festival. It was released in 25 theaters in Colombia, the largest number of theaters for a documentary film opening in the country's history. Sins Of My Father is Entel's second documentary, following 2006's multiple- award-winning "Orquesta Tipica." Red Creek Productions, the commercial production entity that he established with his brother and partner Ivan Entel, has offices in New York, Buenos Aires and San Jose de Costa Rica. Sins Of My Father was produced and directed by Nicolas Entel and produced by Ivan Entel through Red Creek Productions; co-producer, Arie Kowler; narrator, Jorge Enrique Abello.